When going to my usual antique store for vintage watches, the owner said he had a new shipment for me. Did he ever. I picked up two watches. This was the first I pulled out the bucket. A stunning, blue, Waltham watch, with small seconds. I really wanted a small seconds watch in my collection, and I finally have one. It is made in France and I have not had the heart to open up the back to see what makes it tick. Whatever is beating back there is accurate as hell. After 3 days, it was dead on! Not even my new Seiko automatics can boast that. The face is a blue, radial sunburst pattern. The applied markers are crystals/cut glass. The bezel is very small, so even though this watch is just 36mm or so across, it looks much larger. The hands are very long, with the minute hand almost touching the bezel. The tiny seconds hand moves smoothly across the sub-dial and does not stop and start like some sub-seconds watches. The crystal is a lightly domed acrylic with very few scratches. The case is base metal with a stainless steel back. 36mm in diameter and 7mm thick, with the crystal. The crown is signed (W) and turns easily. The movement is a low beat, but very accurate. The lugs are typical 50’s to 60′ at 17mm. The age of the watch is unknown and I have not really been able to find a comparable piece online. I put the watch on a black, alligator grain, patent leather band. I think it is very appropriate for the watch. Overall, the watch is stunning on the wrist and very comfortable to wear. It is very thin (most hand wind only watches are) and look like it was a pretty pricey watch when it was new. It reminds me of Omega DeVille small seconds. It was a great find and is an excellent change of pace from typical, gold or silver face vintage pieces. 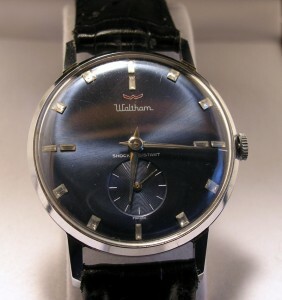 Back: Stainless, Marked Waltham, Water Resistant, Shock Resistant. Movement: Hand wound Waltham, small seconds. Other: Currently on alligator grain leather band. I actually just picked up the same watch on ebay, beautiful watch, im glad to see you have no complaints about yours!